Flexi-Fi is a new financial product for Irish consumers to allow them an easy way to pay for household items and other selected goods. It is offered by the international FlexiGroup Ltd., who are headquartered in Australia and have offices in Dublin, and who already provided Irish consumers with a FlexiRent option for obtaining new goods. We built and maintain their FlexiRent site, and enjoy a good relationship with the entire FlexiGroup Ireland team, so it was only natural that they would also ask to build their new site. We were happy to oblige. We held discussions with the client to obtain all relevant information and knowledge about the Flexi-Fi offering and how it would operate, and we then analysed how best to present this online. We drew up a proposed structure and presented it to the clients, who immediately gave it the go-ahead. The clients also provided us with raw text content for the site. This needed only minor attention in terms of honing the marketing message and making the process clear to customers. Once the structure and content was agreed, we were good to go. We built the Flexi-Fi website in the same manner and style as the existing FlexiRent site, albeit with a different colour scheme in order to differentiate the two products. 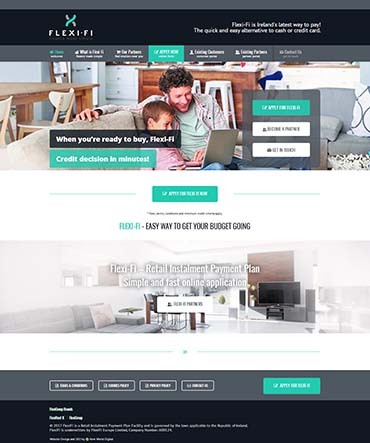 The site is fully responsive and easy to navigate, and includes a full online portal where consumers can apply for finance and quickly receive a decision. The site is to be further developed in the future as more Flexi-Fi partners come on board.